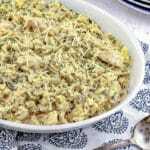 This Chicken and Wild Rice Casserole is a great recipe for a weeknight dinner but it’s fancy enough to serve for a special occasion. 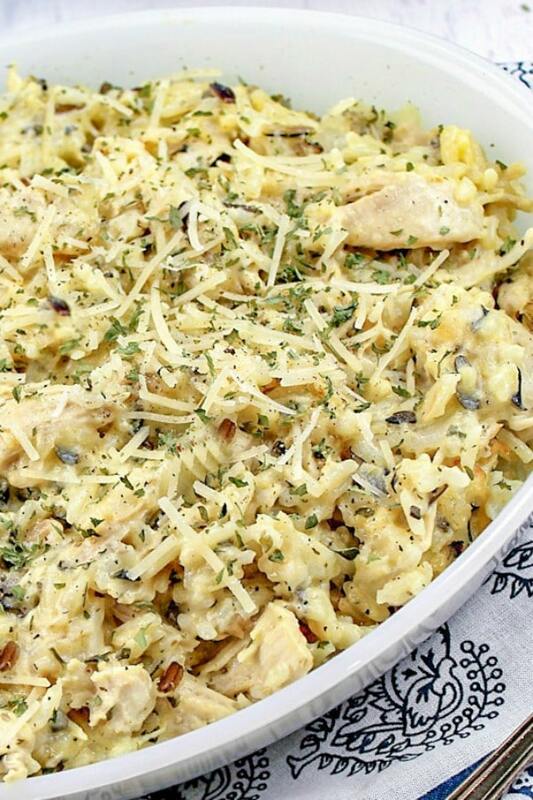 If you love to cook with rice then you’ll love this casserole. This recipe for Chicken and Wild Rice is not new. It’s a classic, in fact they really don’t get much more classic than this casserole. I guess casseroles are considered old fashioned these days but honesty I L-O-V-E them. There’s just something so comforting about them. My husband said it’s one of the top five dinners I ever made. That was a couple years ago and he still talks about how good it is. I have to agree, it’s pretty darn good. Begin, by preparing the wild rice according to package directions. While the rice is cooking in a large skillet over medium hear melt butter and then cook chopped onion until tender and almost translucent. Next, stir in soup, sour cream, basil, half the parmesan cheese and wine or chicken broth. Stir in the prepared rice and chicken. Finally transfer the everything into a 9×13 casserole dish. Finally, Sprinkle parmesan cheese over the top and then place in a 350º oven for 30 to 35 mintutes. Garish with parsley and parmesan cheese if desired. The recipe does call for dry white wine or chicken broth. If you do choose to make this with wine don’t worry about buying a cooking wine or an expensive white wine. I always just use whatever I have on hand; which is usually a Chardonnay or Resiling. It always turns out delicious. If you choose to skip the wine and use the chicken broth you won’t be disappointed. The broth add a rich flavor that gives this dish an little additional comfort value. No matter how you choose to make it this is a recipe that you’ll go back to again and again. 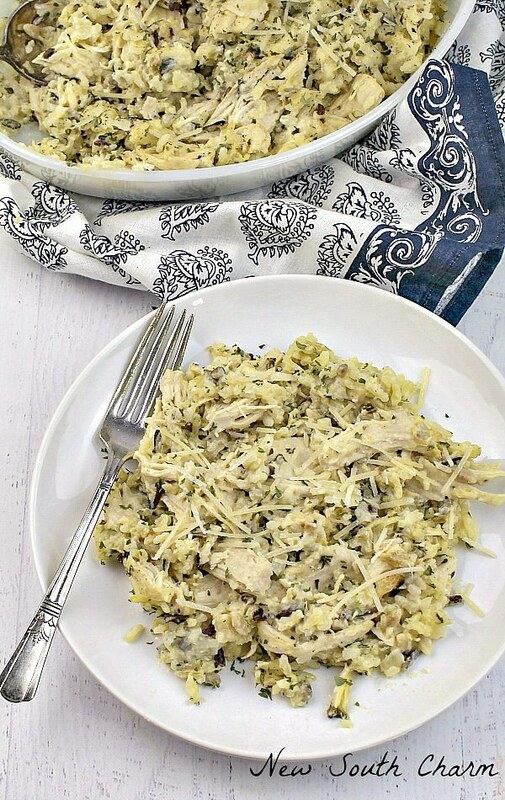 This Chicken and Wild Rice Casserole is a great recipe for a weeknight dinner but it's fancy enough to serve for a special occasion. 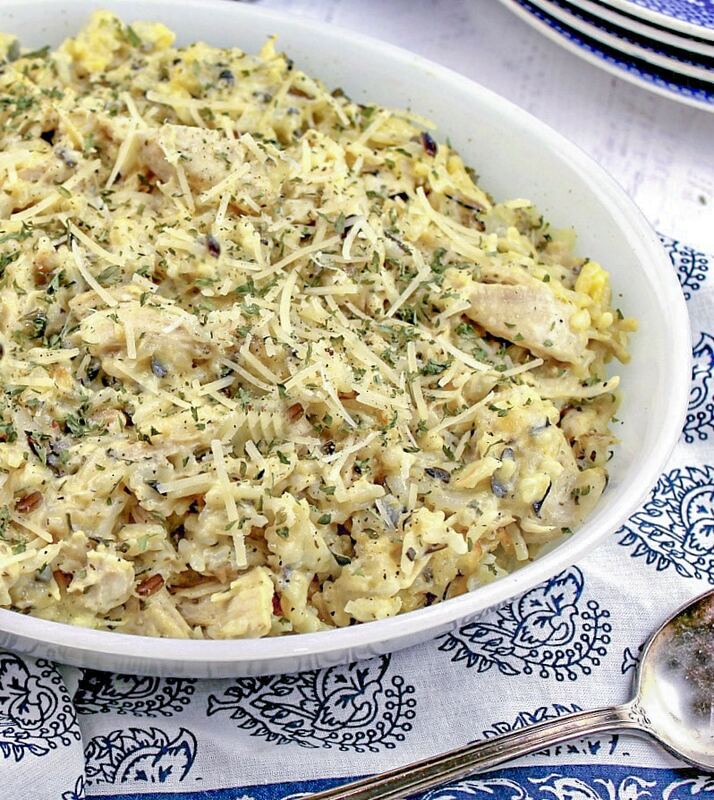 If you love to cook with rice then you'll love this casserole. While is rice is cooking in a large skillet over medium heat melt butter then cook onion until tender. Stir in soup, sour cream, basil, half the parmesan cheese and wine or chicken broth. Stir in cooked rice and chicken. Transfer to a 9x13 casserole dish sprinkle cheese on top and cook uncovered for 30 to 35 minutes. Garnish with Parmesan cheese and parsley if desired. I’ve pinned this post (http://www.pinterest.com/pin/95983035783607129/) because I am looking for new recipes for chicken. Things have gotten a little samey in that department at my house as of late. Looks like a goodie! Yum! This looks so good! I can’t wait to try it, thanks for sharing! Found you on Simple Supper blog hop! That looks delicious! I’m always looking for something different to try with chicken. Yum!! I love wild rice with chicken. Delicious. Thanks for sharing at Merry Monday!! Pinning to my personal board. This looks delicious and easy to make. Thanks for sharing! That looks like pure comfort food! I really enjoy wild rice, it is really tasty and I think that this casserole will taste so good. Perfect for dinner tonight. Thanks. Each box of Rice-a-Roni is 6.9 oz. Did you use 2? The recipe says a 6 oz pkg, so I was thinking 1 (?). Denise I did use two boxes of rice. If you can find a larger size box then you would only need one. For some reason at my local grocery store that was the only size package of wild rice I could find.